Pura Ulun Danu Bratan is an old Hindu temple on the scenic Lake Bratan (Danau Beratan) in north Bali. The 12-story pagoda was built by the king of Mengwi in 1633, and the lake it sits on is actually a crater lake (from an old volcano). It’s also the 2nd largest lake in Bali. The Danu Bratan lake temple is one of the most iconic views in Bali, and it shows up on everything from airline brochures to travel magazines. Sadly it’s also another spot that has been affected by overtourism and overdevelopment, so it can be a bit crowded at times, but it’s still a really nice spot that I think is worth a visit if you have time. 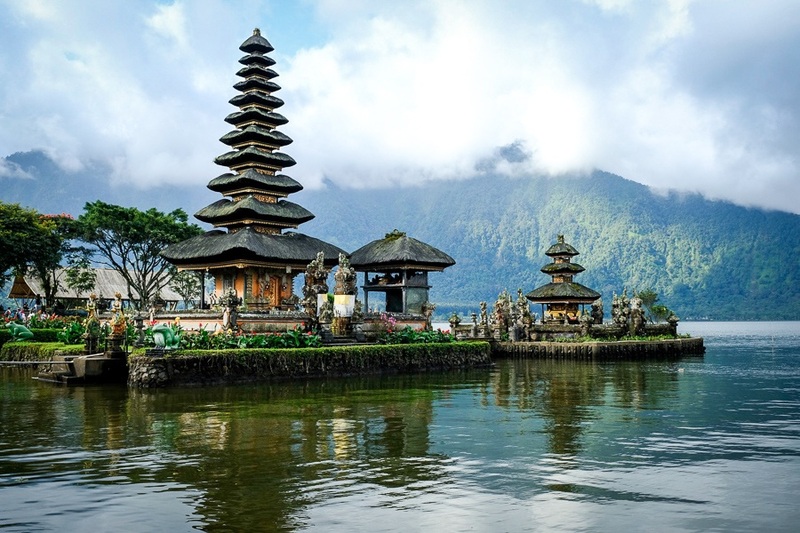 This temple is easily the most famous in Bali, unless you count the Ubud Monkey Forest! If you plan to take photos, I’d recommend getting here no later than 9 AM because the mountains are normally clouded up after that. As you can see in the pictures below, the temple looks way more impressive when the mountains are visible in the background! Side note: drones are not allowed at Danu Bratan since it’s a Hindu temple. The lake and temple are located in Bedugul, in north Bali. The drive takes 1.5 hours from Ubud, or about 1 hour from Singaraja. As of 2019, there’s an entrance fee of 50,000 IDR ($3.50 USD) to visit the temple.